This late stage Folsom preform was discovered in the Lake Ilo National Wildlife Refuge sometime between 1991 and 1992. It was found on the lakebed by the Lake Ilo Archaeological Project team after the water was lowered in 1989 to allow replacement of the aging dam. Thirty-seven site locations were studied within the 600-acre area of exposed land. More than 58,000 stone artifacts were collected. This site is located in western North Dakota near the town of Dunn Center. This late stage Folsom preform was broken during manufacture. It still retains a remnant of the striking platform where a channel flake was unsuccessfully removed. The removal of the channel flake caused the preform to break from an overshot termination. 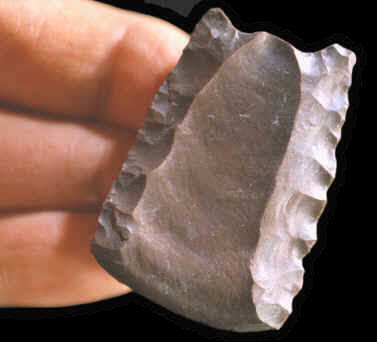 This Folsom preform is made of red chert and it measures 1 7/8 inches (4.7 cm) long.